Most precious metals advanced on the week. Gold and silver were the biggest gainers, rising 1.7% and 2.3%. Gold futures scored a string of twos — they finished higher on Friday for a second straight day, closed at a more than two-week high and logged a second straight weekly gain. Gold for June delivery gained $6.30, or 0.5%, to end at $1,243.80 an ounce on the Comex division of the New York Mercantile Exchange. The settlement was the highest since March 22 when the yellow metal ended at $1,248.60 an ounce. "Gold prices rallied because the market anticipated a change in the Fed’s rate hike outlook," Reuters quoted Stefan Wieler, vice president of GoldMoney in Vancouver. "Now the Fed says two hikes, the market thinks zero, and gold prices hover somewhere around $1,200-$1,250 until this question gets answered." Out of 36 market experts contacted, 15 responded, of which nine professionals, or 60%, said they are bullish on gold. Four professionals, or 27%, said they are bearish, and two analysts, or 13%, are neutral." Elsewhere on Friday, silver for May delivery tacked on 22.6 cents, or 1.5%, to close at $15.384 an ounce. The settlement was the highest since March 31 when silver ended at $15.464 an ounce. Silver prices surged 2.3% this week after dropping 1% last week. They are higher on the year to date by $1.58 or 11.5%. July platinum added $13.70, or 1.4%, to $968.40 an ounce, and moved 1.4% higher than a week earlier. Palladium for June delivery rose $4.85, or 0.9%, to $538.65 an ounce, but fell 4% on the week. For the year to date, platinum is up 8.4% and palladium is down 4.2%. 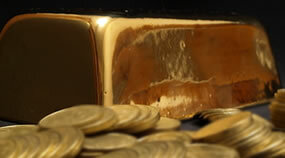 Gold declined $2.60, or 0.2%, to $1,239.50 an ounce. Silver declined 6 cents, or 0.4%, to $15.16 an ounce. Palladium added $1, or 0.2%, to $537 an ounce. For the week, gold gained 2.1%; silver and palladium registered losses of 1.4% and 3.9%; and platinum was unchanged. U.S. Mint bullion coin performances improved greatly compared to a week ago. Gold coin sales advanced 26,500 ounces this week — their biggest weekly gain since Feb. 19, after rising by 10,500 ounces last week. Sales splits include 20,500 ounces in American Gold Eagles versus 8,500 ounces previously and 6,000 ounces in American Gold Buffalo compared to 2,000 ounces previously. The U.S. Mint this week limited sales of American Silver Eagles to 1,042,500 coins, which included 42,500 left over from last week’s allocation of 1 million coins. Bullion distributors ordered 1,006,500, or 96.5%, of them. 2016 Silver Eagle sales remain on record pace at 15,964,000 coins, up 24.2% from the same time in record year 2015.